Adam Robert Oates (born August 27, 1962) is a Canadian professional ice hockey player Known as an elite playmaker, his career total of 1,079 assists was the fifth highest total in NHL history at the time of his 2004 retirement. NHL teams took interest in Adam Oates following his junior season; at least five teams attempted to sign him. Choosing to forgo his final year of college eligibility, Oates signed a four-year, $1.1 million contract with the Detroit Red Wings that made him the highest paid rookie in the NHL in 1985–86. Oates established himself as a full-time NHLer in 1986–87, scoring 47 points in 76 games. 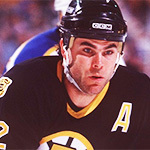 Oates was traded to the St. Louis Blues on June 15, 1989. Oates' best individual season came in his first full year in Boston. He led the league with 97 assists in 1992–93. Oates became the 47th player in NHL history, and the 15th fastest, to score his 1,000th career point on October 7, 1997. The Capitals named Oates the ninth captain in franchise history. At the time of Oates' retirement, his 1,420 points was the 13th highest total in NHL history, and his 1,079 assists ranked 5th. Oates was inducted into the Hockey Hall of Fame as part of its 2012 class.